I am not the greatest making graphs and charts with Excel, but I managed to put labels on for each of the points in the graph I presented in the post for Temple Announcements and Number of Members: Analysis. This way, it is easier to identify trends with when temples are announced by country or geographical area. For example, the Church has announced temples in Latin American countries when there are more members than in countries in other regions of the world. This is likely due to lower member activity rates. See below for the updated graph. Click on the graph so the labels are legible. I'd be curious to see the number of people the temple intends to service as well. For example, the Switzerland temple no doubt was the go-to for many of the surrounding nations. I think it'd also illustrate the effect of small temples--I'd imagine the "minimum" population requirement fell dramatically with President Hinckley's announcement. I suspect a lot of it has to do with the ease of travel. In the most recent conference, one of the talks mentioned that, post-9/11, it got a lot more difficult for people in British Columbia to go to Seattle. So they built / dedicated the Vancouver, British Columbia Temple, even though the local membership numbers may not, normally, have warranted that so soon. Ditto for the Freiberg, Germany Temple. That was built in East Germany (back when it still existed). There were plenty of active Saints, but likely not enough to meet the usual numbers to warrant a temple. The fact that it was difficult (bordering on impossible) for East Germans to travel somewhere else had a lot to do with that one being built and dedicated. Puerto Rico has had a significant number of active members for some time but they've been reasonably close to Orlando, Florida (dedicated 1994; there are usually direct flights between San Juan, PR and Orlando, FL) and Santo Domingo, Dominican Republic (dedicated 2000). People in the Dominican Republic have a harder time traveling to Puerto Rico than vice versa so it makes sense that DR got one before PR. Still, having been to Puerto Rico multiple times, I was quite happy to see them FINALLY getting a temple. Yeah, I imagine Puerto Ricans leaving the island for temple worship is a hardship for many. Yeah, the Switzerland temple was chosen as the first in Europe not because of the membership in that country but because of its central location and many languages spoken. And it was sort of a "If you build it, they will come" mentality since there were no stakes at the time if I recall correctly. The Minsk Belarus District just popped up on the Meetinghouse Locator with its 3 branches, indicating that the church is fully recognized in that country now. I certainly understand the mentality of the adapted old adage: If the Church builds temples, the people will utilize them. And it has surprised and pleased me to see how some temples in more remote areas has led to many more people being open to hearing about the gospel. I see quite a few of the 19 temples announced this year as being in the vein of an announcement that will hopefully motivate and drive Church growth in such areas, including India, Russia, and Guam, just to name a few. Clint, thank you for mentioning the creation of the Belarus district. That is awesome! Hopefully now the Church will have a better chance of growing and expanding throughout Belarus. Depending on if, when, in what manner, and how soon that occurs, Belarus may be a nation to watch for a potential temple at some point in the future. That said, if I may, I wanted to mention something personal I have dealt with in relation to my blog, to which I have posted links in these threads previously. I found out earlier this afternoon that the template I was using there had malfunctioned, and that I needed to thus change the design and layout of my blog. So in addition to carrying ongoing reports today about the latest Church and temple news, I have tweaked the layout and would welcome any feedback any of you has on the new look or any of the newest content. With my ongoing thanks to all of you for the great discussions we have here, and to Matt for providing ongoing analysis of Church growth matters, for allowing our discussions in these threads to be as wide-ranging as they are, and for his continued approval in allowing me to do so, I want to again pass along the address of my blog. Any feedback is welcome on any post at any time. Thanks again to you all. The address of my blog follows below. Could some of the reason (besides revelation) for Europe's first temple be because it is politically neutral with other nations. Swittzerland has good relationship with other countries. It is also centrally located on the Continent. It has been listed as one of the most stable, peaceful, and free countries in the world. Great points, L. Chris Jones! As noted before by many of us in many discussions which have previously occurred here, there are a variety of factors (some of which may only be known to those involved in the deliberations about such decisions) that go into the reasoning behind building a temple anywhere. But if what you say is correct, and if that was the case at the time that temple was announced, it wouldn't shock me if that was the easiest option. It has always intrigued me to see how quickly the number of temples increases as time goes on. It took the Church over 1.5 centuries to have 50 temples in operation. In the late 1990s and early 2000s, that number more than doubled. And within the last 18 years since that time, the Church now has over 200 temples in various phases of construction. Based on that, I could see the Church doubling or tripling that number within the next decade or two, and that is staggering to think about. No potential location may then be considered off the table. Hope these additional thoughts are helpful to any who read them. Most of Europe was still devastaed form the second world war. Switerland hadn't been in a armed conflict with a foreign power since napoleon (ca 1800). Policital stability. Religious freedom. A kind of recognition of the church (at least by law) so that the church could own property. It was at the heart of the european rail network. Also Belgium, Austria and Finnland had a few hundred members ( 200 - 450). Other countries had no niticable church present at that time. So Switzerland was only 5th in the number of members. But Switzerland is small and its membership was close togehter. Members were also considered mature (Mission leadership done localy during both world wars), More multi geneation members than other European countries, because fewer members emigrated to the US. Prophecy of Joseph F. Smith about a temple in 1906 when he visited Switerland. I think all this reasons matter but the main one is that Switzerland was not affected as much during world war 2 and mature membership close together. Membership wise germany would have made sense but it, suffered so much form the war and the church might have been afraid of instability of divided germany. The UK was already considered for a temple an got it a few years later. Fascinating chart. What I would like to see is a chart comparing the number of members multiplied by the per capita GDP of the country. 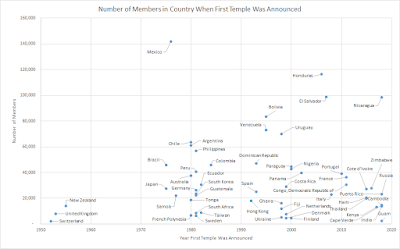 It appears that richer countries get temples with fewer members than poor countries. I think creating the above graph would allow one to test this hypothesis. This would be an indirect way to see if temple building is associated with tithing receipts for a country. Miro, thank you so much for this great information! I have always admired the pragmatic, hard-working Swiss people. My uncle served his mission in Switzerland 95 years ago. He and his Swiss wife have had over 400 descendants, and you are right--fewer Swiss members (my late aunt included) emigrated to America than from many other European countries. Scott Vance, I am not sure how much you know about the way the Church uses tithing, but it has been a long-standing practice of individual Church units to transfer any funds they are not using for local needs to Salt Lake to be used at the discretion of the 18 Brethren comprising the Council on the Disposition of the Tithes. 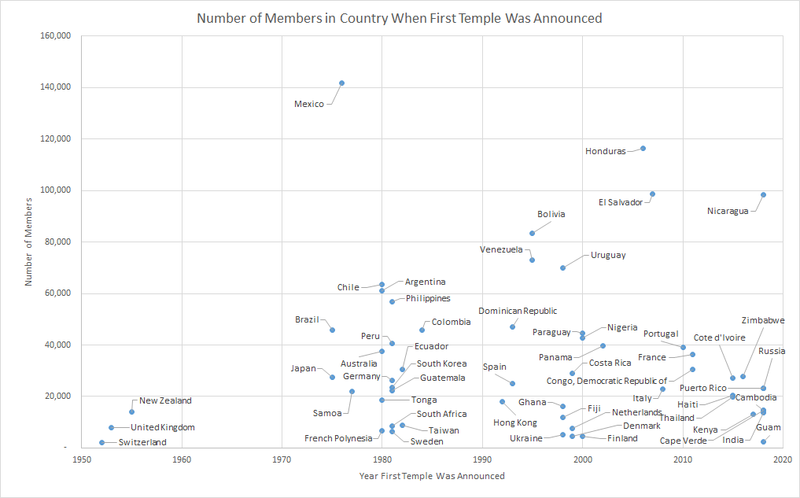 So it might be difficult (if not impossible) to determine if countries with a higher GDP are more likely to get a temple sooner than those that have a lower GDP. And if you look at many of the temples announced since April 2015 are for areas that may not have as much of a high GDP. The important factor is not how rich the citizenry of any region might be, but rather, where the Brethren see a need for a temple to be built. Is there some correlation? There may be. But I think you will find if you look into the 31 temples announced since the beginning of 2015 that the GDP has very little to do with the timing of a temple announcement. One other thing is worth mentioning: While I appreciate the many suggestions people are making here which are directed to Matt about other things they would like to see, I am sure that anyone who can find information on the factors they would like to see covered could put something together. There was a recent conversation on the reddit named for this blog from someone who has expanded the scope and details of a map Matt posted here earlier to show the impact of the temples which are under construction or announced. There is some information which may be easier for some of us here to find, research, and report on than it would be for Matt. Given that Matt has said he is not great with graphs and similar things, if those suggesting a graph on different factors were to find and formulate graphs focusing on other factors, that would leave Matt with more room to focus on topics which may be more important to the discussion of Church growth than the factors suggested here. Just a thought, for what it may be worth to anyone here. Sure, while some could do their own studies on temples and their impacts/influences, Matt seems to be the one who is the most dedicated to the subject, as well as very capable. My suggestion of concentrations of members surrounding a temple might be doable by numbers of districts and stakes extant when dedicated. I could do this, I guess, but I think a few others more capable or disposed to do it. Suggestions are meant to inspire, not correct or burden anyone. Ideas flow freely and hopefully grow like our Church membership. Your point, Eduardo, is, as always, well taken. My comment above was more to the point that Matt indicated in this post that he was not the best at graphs, and that perhaps someone who has expertise in creating or expanding graphs (which, by definition, includes a few people who regularly comment here) could easily find information about and formulate graphs on that subject. Matt has always been a foremost expert on matters of Church growth, and I applaud him for his ongoing efforts. But others are similarly capable of compiling information, formulating graphs, and providing the requested information. As I mentioned, a regular contributor to the comments of this blog reached out to me via the Church growth reddit to let me know that he had expanded one of the graphs Matt had worked with. So all I meant was that, in that kind of scenario, someone with the know-how can expand such factors. Matt will always be the expert in general Church growth topics, but when it comes to graphs, the work of others might be analogous to the way that several who comment here work together to compile a list of the latest Church unit changes. I hope this clarification puts my comment above in greater context. I meant no offense to Matt or to anyone else who comments here. Thanks. Some context is added through the following articles, the first from KSL and the second from lds.org. In that last article, it is mentioned point-blank that cultural celebrations the night before temple dedications have been officially replaced with devotionals with presiding Church leaders for the youth. I can see why this change is necessary. It is not just about reducing and simplifying the work of the Church. While President Monson voiced appreciation for such celebrations, I think that President Nelson has observed that youth are so busy preparing to participate in those events that that detracts from their ability to focus on the dedication of a temple in their midst the following day. By taking the emphasis off cultural celebrations and placing it on youth devotionals, that allows the youth to focus on preparing for the temple dedication, which is a much better idea. My thanks again to Matt and to all of you for all you do to contribute to our mutual discussions about Church growth matters. It seems to be unclear about the church sponsored pageants such as the Manti or Hill Comorah pageants. I would think and hope those pageants would continue on. My oldest son has his heart set on being in one of those pageants some day. Ok after reading other articles the larger pageants are expected to be scaled back at least in regards to the Manti pageant. Not sure about the others, but that seems to be the intention to no longer have large scale pageants. I wonder how pageants at Palmyra or Nauvoo will be handled since the cast are part missionary and part local membership. I’m really unsure how many missionaries participated in Manti. Also since Puerto Ricans are US citizens going to Orlando and lattter Fort Lauderdale is much eisier than for Dominicans. Until the Swiss and British Temples were built the most active members would move to the US so they could attend the temple. Building the Church up under such circumstanes was difficult. Also the devastation of World War II had caused many to leave. Lastly in Germany especially there were those in the Church who had supported Hitler to various extents. For some the easiest way to deal with the disconnects this created was to go to a new land. The Church may have stopped preaching the gathering in the 1890s but in the late 1940s Saints coming to Utah from Europe and seeing the temple for the first time feom the train felt they were just as much part of the gathering as anyone who drove an ox cart or pulled a handcart. Due to how many resources were needed to make this long internarional journey few approached it as just a trip to the temple and returned and many stayed in Utah or at least the US. Even after the temples were built in Europe the urge to be where many other Latter-day Saints were for your children to marry still caused many members to emigrate, combined with educatuonal policies that made it difficult for those serving missions. On another note two major developments. Church leaders have discouraged pageants with the Hill Cumorah Pageant apparently slated to end in 2020 although the fate of other existing ones is unclear. The Church has also put out a website on abuse with broad ranging aections on treatment, prevention and intervention and healing. Fox13 (KSTU/Salt Lakek) is reporting the Hill Cumorah pageant will end after the 2020 run. In comments in a meeting with President Nelson the day before the dedication of the Concepcion Chile Temple the mayor of Concepcion praised among other things the Church does the addiction recovery program. 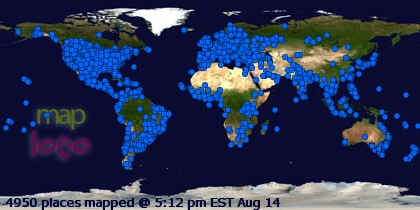 How often does cumorah update maps & statistics? I just was told by a Belarusian member of my ward in Spain that the Minsk district is far older than that. It was organized around 2003. This Meetinghouse Locator is no accurate or up-to-date. Please someone report! There are many districts and branches that don't show up in the Meetinghouse Locator, particularly in places like Pakistan, China, and Saudi Arabia. Information about units in areas like this is kept secret for political and/or security reasons. The list also includes Nepal, Bangladesh, Laos, Burma, Iraq, Afghanistan, Syria, and until very recently Belarus. The existence of these units has long been known thanks to studies by Cumorah.com, but the fact that the information is now being publicized on the Meetinghouse Locator is significant with regards to the official recognition of the church in that country. (Some also suggest Talca Chile Stake, as #21, but I believe not, since assigned to Chile Rancagua Mission). All included in the Chile Concepcion, Concepcion South and Osorno Missions. Jim, you mentioned missionaries being involved in the Hill Cumorah Pageant, and I don't remember that (apart from the presence of a Church visitors' center on the site). However, I wasn't directly involved in the production of the pageant and I guess maybe I just didn't notice. It's true that a lot of the cast came from far away (I believe there were whole families from Utah who would sign up to be in the cast- it was always fun to see the cast members, including some children, walking through the audience before the show started, and to try to guess from their costumes what character they were playing), and also it seems like the director was frequently from Utah. However, I knew a few local cast members, including one young man (whose parents were in my ward) who was cast as Jesus in the scene where he descends from heaven and got to be on a wire). My grandmother participated in the Hill Cumorah pageant while serving in the eastern states mission in the 40s. At least back then, the missionaries were often part of the background cast. I dont know if it is still that way. I have mentioned previously here how my mom, a South African native, came to the USA on a "short vacation" in the mid-to-late 1970s that only technically ended last year, when she returned "home" for the first time. And I believe I have also previously mentioned that my parents originally met on a "blind date". But what I didn't mention is that, for their first date, my dad took my mom to the Manti pageant. Since she had not been born and raised here, she hadn't realized the actual distance they would have to go to get to the pageant. But it worked out well, because they formed a connection that led my dad to serve a mission, during which time he and my mom (who was also in the mission field) exchanged letters. And it paid off for both of them. The day after my dad was released from his mission, he proposed to my mom. And that likely would not have been possible without their first blind date to the Manti Pageant. I can certainly understand (and to a degree, appreciate) the reaction of many who are justified in saying they will miss the pageants and the personal impacts it has on their lives and on the lives of those involved in such productions. But I can also see why the Brethren feel a need to take action on this issue. I mentioned this in an earlier comment, but it bears repeating: Though the Church hasn't spelled this out, I imagine one big factor which went into this determination (and the decision to discontinue cultural celebrations in favor of youth devotionals the night before a temple dedication) is that people were spending so much time on preparation for such events that it was taking away time they could be spending with their families. I know in some cases, while youth have expressed their thanks for the opportunity to participate in cultural celebrations of the past, that participation may in part be taking away from their ability to be adequately prepared for, get the most out of, remember, and enjoy the experience of a temple dedication. Having a youth devotional the night before a temple dedication instead will allow those youth to focus on the main purpose of the weekend: the dedication of a temple in their midst. But I am sure there are other factors we don't know about which also impacted this decision. Either way, I am not so much worried about why this is being done, or how it might impact those people and communities affected by this decision, because I know that those questions were deliberated thoroughly before this decision was made. Instead, I will be anxious to see what this change does in terms of increasing family time, allowing youth to more fully focus on temple dedications, and enabling local congregations to have more of a say in what gets done with these pageants. As all of that unfolds, I am sure that we will see the wisdom behind this action, even if in some ways, to some people, it doesn't make sense. That said, I was happy to see that the Concepcion Chile Temple was dedicated today. I look forward to seeing how the Saints in that district are blessed by this new temple. And I likewise look forward to seeing what other temple milestones will be observed during the remaining two months of this year. Chris, I am glad to see your breakdown of stakes that might now be assigned to the Concepcion Chile Temple. I am not sure how the Santiago Chile district might be impacted by this temple's dedication, but it is good at least to think about. I had an additional thought: Given that Argentina went this year from having two dedicated temples to having two others announced, I would not be in any way shocked to see one or two other temples announced for Chile in the near future. I have had my eyes particularly on Antofagasta and Valparaiso. Given the 19 temples that were announced this year, it would not shock me to see both Chilean cities have temples announced within the next 5 years. The Lord, acting through President Nelson, continues to be very much aware of the needs of His people, and the things that have been and will yet be announced will certainly help facilitate those needs, both for the Church as a whole, those in various parts of the world, and each of us as individuals and families. If this is really only the tip of the iceberg in terms of what's coming, it will be more important than ever to remember that the Lord leads His Church, and to be ready for whatever else might be coming down the pike. Miro, I also appreciate your list of reasons why Switzerland may have been picked for the first temple in Europe. If this isn't too obvious to mention, I would suggest adding something like "the Lord foresaw future growth" to your list (this is related to but slightly different from your mention of the prophecy by Pres. Joseph F. Smith). For example, there were few if any members in Italy at the time that temple was built, but it was definitely more accessible to them, when they did start joining, than one in Germany would have been. I would add that it thrills me every time I watch the Church's movie "How Rare a Possession: the Book of Mormon" to see early Italian pioneer Vincenzo diFrancesca walk up to and then enter the Switzerland temple. The countries that are most involved in anti-proselytization (be it by laws or by extra-legal pressures. Certainly Muslim countries would head the list. In addition to India, I would also mention Russia and China. The 1997 law on religion already gave a privileged position to the Russian Orthodox Church, but this has been greatly enhanced by the Putin government, and has been accompanied by pressures against all non-Orthodox missionaries, especially against Evangelical Protestants and Uniats, also known as Greek Catholics, who follow Orthodox rites but recognize the authority of Rome. China has laws against the propaganda of “evil cults”, a flexible concept that, depending on shifting party policies, may or may not be used against Christians. Evangelical Protestants and their enthusiastic proselyting have been a major target of anti-missionary policies by governments. This has not stopped the explosive growth of this version of Protestantism in much of the world. The antiproselytization laws in India Russia, China and Muslim countries pose great difficulty on these countries receiving the gospel. No wonder they barely grow in LDS conversions. I believe that many of the lands with anti-proselyting laws and restricted freedoms allow our church, among other churches, and certainly Muslims in most of those countries, to concentrate on the the places that we are allowed to preach and convert. I have stated many times before that so many potential missionaries have never served, and perhaps worse yet, those people (mostly young men that I count) go less active and drop out. I will name a few, for our collective prayers now, prayers that will work with faith, and if by chance they ever read this: go back to Church! Achieve all the blessings you deserve. The Neals, the Sheltons, the Doyles. Just between these three families there were 9 boys who never served. These were active families. 2 of the 3 parents still should be. If only 4 of the nine young men had served missions, and extrapolate that across just my home state of Indiana, where maybe there have been 90 or so units (give or take) over the decades, this relatively small Church of Jesus Christ US state could potentially populated a whole mission in numbers. I know in bigger Church states more missionaries serve due to higher peer pressure; I feel like too often in Indiana the peer pressure can run the other way. I think we can all identify people who should have and could have but did not serve. Until we have those kind of numbers, China and India, and other marginal lands of freedom will not open up. Faith precedes the miracles. At least we are finally in Vietnam. Huge opportuny there and in many newer countries, more in Africa. Not to burst too much of a bubble, but my brother-in-law knew Vincenzo in Italy during his mission in the south, and apparently he was not known as a really reputable guy. A little off, I guess. The story is still powerful and true, as I know it, and I only hope that all of us can live full lives and hopefully inspire others to join. The video that now is included in the press release about the dedication of the temple interviewed a couple from Zapala Argentina that will be temple workers in Concepcion and drove 6 hours to get there. Perhaps more stakes in pategonia will be included in the temple district. There will be a new stake created on November 18 in Santaquin, UT. It will probably be called Santaquin East. Looks like my prediction was off by 3 stakes only. according to Rick's temple site..new Concepcion Chile district also includes the Talca Chile stake and on other side of the Andes, the Bariloche and Zapala Argentina stakes. Melody, it is nice to hear about the new stake that will be created in Santaquin in a couple of weeks. During most of my elementary school years, my family lived in Payson, and my classmates (among whom were many dear friends) came from Santaquin and Elk Ridge, among other nearby communities. That will be another stake for the Payson Utah Temple District. I have mentioned on this blog before that, while we lived in Payson, my family and I always hoped a temple would be built there, but we moved away from that area in early 1998. But we were elated when, in January 2010, a temple was announced for Payson. We still have many dear friends who live there for whom the excitement of having a temple in their midst has not worn off or diminished one bit. Chris, depending on what occurs in the future, I am sure we will see more Chilean temples built. As I mentioned previously, I am watching Antofagasta and Valparaiso Chile in the near future for temple announcements, and if that occurs, then that might further divide the existing Santiago and Concepcion districts. But more than that, with two new temples having been announced for Argentina just this year (for Salta and Mendoza), there is a possibility that there could be further overlap in terms of which Chilean and Argentine stakes are assigned to the newest temples for Argentina, and to the potential temples for Antofagasta and Valparaiso. Either way, one thing seems certain: With the entire South American continent seeing extensive Church growth on an ongoing basis, we are almost certain to see several other temples announced in the coming years for that continent. The Lord certain seems to be hastening His work in miraculous ways throughout the entire southern hemisphere, and it has been a blessing to watch that process unfold. I hope these additional thoughts are helpful to all who read them. Being a lone member in an area is hard on many people, and what it entails going through is complex and we should not be quick to judge those who are. Di Francesca never was really in a place where the Church was fully organized. On the other hand his level of Church contact is not an extreme low. That record goes to Samuel Chambers who was baptized as a 14-year-old slave in Mississippi in 1844. His next contact with the Church came in 1868 when he showed up in Utah bringing his wife, son and his sister's family having spent the four or so years since he had been freed saving to gather with the Saints. That is a record of 24 years of no contact of any time with the rest of the Church. That is less time than Anthony Obinna or J W. Billy Johnson or John Mensah in Kumasi waited from their first learning of the Church until the day they were baptized, and for them there were some personal contacts and more by letter. I have to admit I understand why the end of the Pageants is a good thing. They had become such large productions that they largely consumed resources to perpetuate themsevles, instead of focusing resources on this the Church leadership feels that there are much better uses of resources. THe pageant early on had most of its backup staff as full-time missionaries and most of the performers were BYU students with for many years the director being a BYU faculty member. Starting in the 1970s they shifted to no full-time missionaries, and more of the cast from the North-east US. However many people still traveled very large distances to be in the pageant. I have to admit I always felt they should have banned people coming from Utah to be in the cast.